Could the Treatment in the Article, or Something Similar, Be Used for Antisocial Personalities? 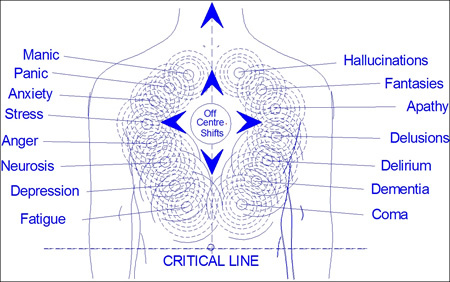 Article: “Vibration-Oscillation Diagnosing and Healing Therapy,” by Elena Evtimova PhD and Jon Whale PhD(more info) … listed in energy medicine, originally published in issue 167 – February 2010 .. Image: Heart chakra: http://www.positivehealth.com/img//img/image-article/Issue%20167/Articles/aFig%202d%20AP%20Torus%20V1.jpg .. I like that this image is showing a center point, the red torus … which some refer to as the null point or zero point; others call it the hridaya, the hidden inner heart. Then too, the drawing shows both the front and back funnel of the heart differently from those of other artists. My own feeling is that both the front and the back funnel bring energy into the hridaya, and send energy out to the ‘world’ (which may also be conceived as the outer sheath of the human EMF torus). It might be possible to imagine the artist’s rendition of the heart as showing red vortical energy incoming to the hridaya and green vortical energy outgoing from it, although this is not perfectly clear in the image. I figure that artistic rendition of the movement of the EMF though the chakras, of which this is one example, must be a difficult thing. Image: “Oregon vortex”: https://i2.wp.com/www.fuzzyfun.nl/wp-content/uploads/2015/05/189k4b3uyjmz6jpg.jpg?fit=640%2C360 .. I can tell from experience that the front funnel of the heart of antisocial personalities brings energy in to the hridaya of the antisocial personality, but doesn’t send energy back out to the world (or to the outer sheath of the antisocial personality’s EMF torus). Image of tilted heart chakra: http://www.positivehealth.com/img//img/image-article/Issue%20167/Articles/aFig%202e%20AP%20Man%20Torus%20Dropped%20V1.jpg ..
My thought is that the tilt might be at any inclination, not just a superior tilt to the back funnel and an inferior tilt to the front funnel as shown in this image. The angle of the tilt might also be left-right, in any series of angles. Could these different tilt possibilities then cause the displacement of what the author terms the ‘assemblage point’? Image: “Fig. 2c Approxim ig. 2c ate Assemblage Point epicentre locations for various conditions www.nakedspirit.co.uk/” : http://www.positivehealth.com/img//img/image-article/Issue%20167/Articles/aFig_2c.jpg .. 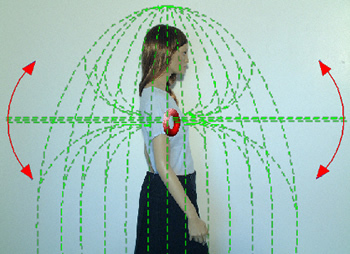 Image: Optimum tilt of the heart chakra: http://www.positivehealth.com/img//img/image-article/Issue%20167/Articles/aFig%202f%20AP%20Woman%20Torus%20Arrows%20V1.jpg .. I wonder how these artists’ conceptions would fit in with the notion that all the chakras call swirls in the human EMF? How would a diagram look, with all these swirls? 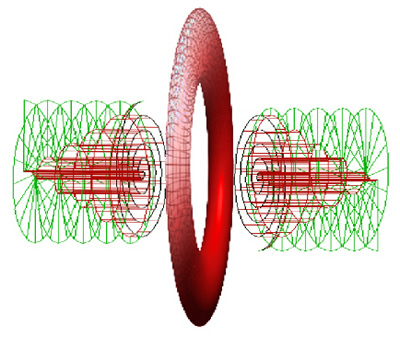 How would the swirls affect the look of the outer sheath of the human EMF torus? How do the chakras of Earth affect her magnetosphere? And would this affect weather, cloud formation, wind flow, ocean current flow, the movement of the east-west electric charge current that follows the setting sun around Earth, the distribution of solar winds as they exit the hollow central core of Earth’s torus at the North Pole, and the formation of cracks in the magnetosphere? Then as to the medical treatment mentioned in the article; the concept is appealing to me, though I would be very careful about the presence of electronic equipment and strength of energy flow. 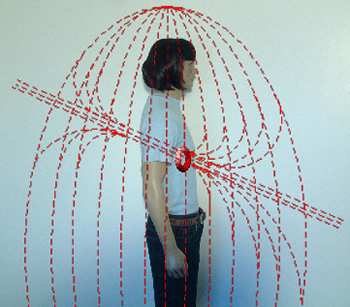 Quite recently I had an unfortunate experience with electricity flow at an acupuncture session. The therapist used pins to open up the energy flow in my left foot and calf, and that part was fine. Then the therapist attached electric acupuncture stimulator wires, and turned on the machine. Some years ago, I underwent this type of procedure using an electric acupuncture stimulator with great success. However this time, I experienced something like a localized lightning strike or an ‘electrocution’ effect to my lower left leg, which jerked and flopped around spastically until the therapist turned off the machine. Possibly the machine was faulty, or the current was turned on too high. Also possible is that, as our quotient of light increases, sensitivity to electricity and electronics is greatly heightened, and that this ‘EMF Hypersensitivity’ will require changes in time-honored alternative and mainstream medical treatment techniques. Thus I would say: As your light quotient increases, it might be best to stay away from electronics and electricity as much as possible. When therapy requires them, start very cautiously, and increase strength of the energy flow only if all goes well at the lowest level. Taking all this into consideration, I wonder if the treatment in the article, or another treatment along similar lines, but perhaps without the use of electronics, might provide a cure for heretofore difficult-to-treat psychological conditions such as antisocial personality, paranoid schizoid conditions, schizophrenia, and manic depressive disorder. This entry was posted in 4th chakra - heart chakra, Antisocial personalities (see also 'Feral children'), Astrogeophysics - EMF - hologram, Crystals - gems, Earth - Gaia, Electronic devices - electrical devices, EMF hypersensitivity, Health - healing, Heart energies, Human torus, Plane of Forces: electricity - gravity - magnetism - fohat - prana - kundalini, Psychology - Psychiatry, Subpersonal chakras, Yoga and tagged 4th chakra - heart chakra, acupuncture, antisocial personality, astrogeophysics, Chakras, Earth chakras, electricity, Electronic devices - electrical devices, electronics, EMF hypersensitivity, Gaia, light quotient, Plane of Forces, psychiatry, psychology on 20 June 2017 by Alice B. Clagett. The Urban Legend about Using the Tachyon Field as a Weapon of War … or Is It the ‘Attack Y’all’ Field? The Urban Legend (con’d): Authority by Government Grant to Kill Women?! My electronics, those that I’m physically near, have been going down during Solar Events. Just before this, the astral air thickens with other people’s curses, which I clair hear. Then a sparky energy starts to come out of my eyes and my heart; perhaps these energies of annoyance or aggravation cause the trouble with the electronics. To solve this, I get up and walk away from the electronics, as I gather that the emotions of annoyance and aggravation can subtly alter the workings of those ‘half-astral’ devices we call electronics. THE URBAN LEGEND ABOUT USING THE TACHYON FIELD AS A WEAPON OF WAR … OR IS IT THE ‘ATTACK Y’ALL FIELD’? The truth of the matter was, that the leader of the meditation was feeling hatred and anger and upset against women. So he, and the other men in the meditation group … the men that were ‘under his command’ … used that energy to attack the women in the group. A grant was approved for the study of this ‘weapon of war’ … so the Urban Legend has it … and a trial was begun, using the women in the meditation group as test subjects. The question, to be proven or disproven, was: Could the Attack Y’all Field be used by the men in the meditation group to destroy the women in the group? The Pentagon would pay good money for this, or so this amazing urban story went. The experiment was undertaken. Some of the women passed on because of it, but others rose to faith in God and got through the whole thing. The “Attack Y’all Field” is the energy of hatred, of misogyny, of loathing, of anger, of annoyance, of grievance, of some kind of negative energy of the heart chakra and attacks the person that’s the object of that emotion. It’s much worse if the people in a group get together and decide they’re going to attack someone. Whether its a bunch of women attacking a man, or a bunch of men attacking a woman, or attacking someone of the same gender. It just doesn’t matter. It’s the numbers of people that feel hatred for some particular person, or perhaps for a smaller group, that cause the trouble and the mischief on Earth. There’s nothing that the black magic realm can do with that. Nothing at all. This is the energy of Christ consciousness that you send back, and there’s no response from the lower realms, from the hellworlds, for that. It cannot be. It’s the same with electronics, you see. Other people’s hatred, directed at us, can influence our electronics to temporarily go down. In the same way, hatred destroys this world. But our loving heart energy can influence the electronics to work perfectly, proving that love builds this world. Why is this? It’s because electronics are half-way between the astral world and the physical world, in the way that they work and the energy they work with. Thus they are more sensitive to the energy of our human electromagnetic fields. As such, as half-astral inventions, they can prove to us this point: That hatred destroys this world … it’s that Shiva thing. And love builds this world up … that’s that Brahma thing. And Lord Vishnu dreams the dreams of the illusion until a new illusion is built. This is the Trimurti: Lords Shiva, Brahma, and Vishnu. All beautiful energies, but, Can we use them wisely? Can we use the Shiva energy to destroy what ought to be destroyed? Can we let that Tachyon Field thing go? It’s time! It’s time to stop worshipping Lord Shiva just because we feel angry, don’t you think? Lord Shiva ought to be the thing that we use with great discretion to tear down the old so that the great New may begin … a New Beginning for New Earth, don’t you think? Image: Lord Brahma: https://iamofthestars.files.wordpress.com/2016/11/910c4-brahma.jpg .. 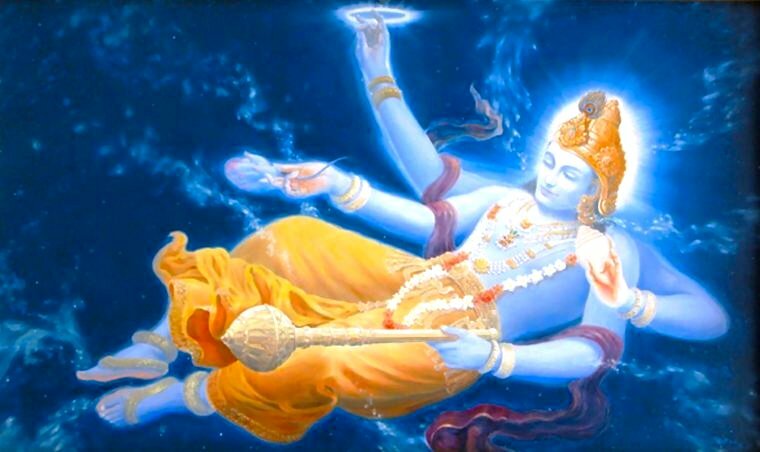 Image: Lord Vishnu http://gemstoneuniverse.com/blog/wp-content/uploads/2013/07/Lord-Vishnu-as-Akshara-the-Indestructible.jpg .. 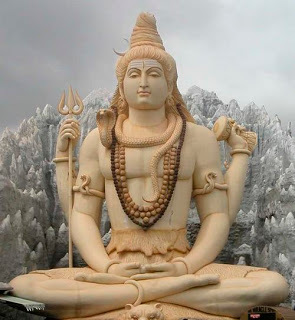 Image: Lord Shiva: https://iamofthestars.files.wordpress.com/2016/11/bf145-lordshiva.jpg .. This entry was posted in Anger - rage - violence - hatred, Artificial EMF fields, Curses, Electronic devices - electrical devices, Heart clearing - unconditional love, Misdirection: 'war effort', Misogyny - philogyny - respect for women, Psychology - Psychiatry, War and peace - imprisonment and freedom and tagged aggravation, annoyance, astral plane, black magic, Brahma, electronics, hatred, love, misogyny, physical plane, Shiva, tachyon field, Trimurti, Vishnu, War on 14 November 2016 by Alice B. Clagett.